Posing as servicemen, they enter the deposit, neutralise the alarms, and proceed to drill a hole into the wall of the safe. Two days later, they manage to escape worth allegedly over £200 million worth of stolen jewels and money. When police are called to the scene and investigation starts, the cracks between the misfit gang members begin to show as they row over how to share the goods and become increasingly distrustful of each other. Meanwhile, the crime has become public knowledge, and a frenzy of speculations begin. The 'King of Thieves' competition has now closed. Winners will be announced shortly. Competition opens at 5pm AEDT on Sunday 17th February 2019 and closes at 11:59pm AEDT on Sunday 24th February 2019. Five winners will be chosen at random on Monday 25th February 2019. To successfully win, entrants must fulfil the above entry conditions before the time the competition closes. Current members/followers are eligible to enter the competition. Only one entry per person. Only one winner per household. To be a valid winner, the entrant must not have won a prize from SWITCH within the last 28 days. Each winner will receive one double pass to 'King of Thieves'. By entering, you agree to receive occasional emails from SWITCH in the future. If you decide to unsubscribe from these updates, any further entries will not be applicable. Only Australian residents are eligible to enter. 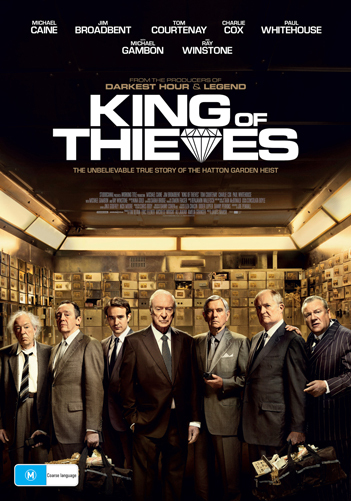 'King of Thieves' is in cinemas from Wednesday the 27th February 2019 through StudioCanal.